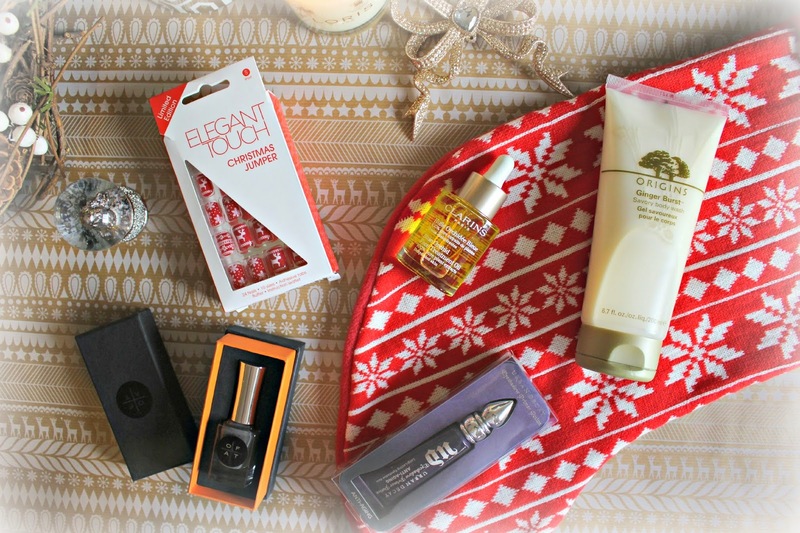 The final instalment (maybe) of my Christmas gift guides, is the Beauty Stocking Fillers. These little beauties are products which everyone will love, they are inexpensive and the perfect size for a dreamy stocking filler. I’ve included a chic grey polish from Only Fingers & Toes, Urban Decay‘s Anti Aging Eyeshadow Primer Potion, Origins Ginger Burst shower gel, Clarins Blue Orchid Face Treatment Oil and these super festive Christmas Jumper nails from Elegant Touch. Firstly, how cute are these nails!?? 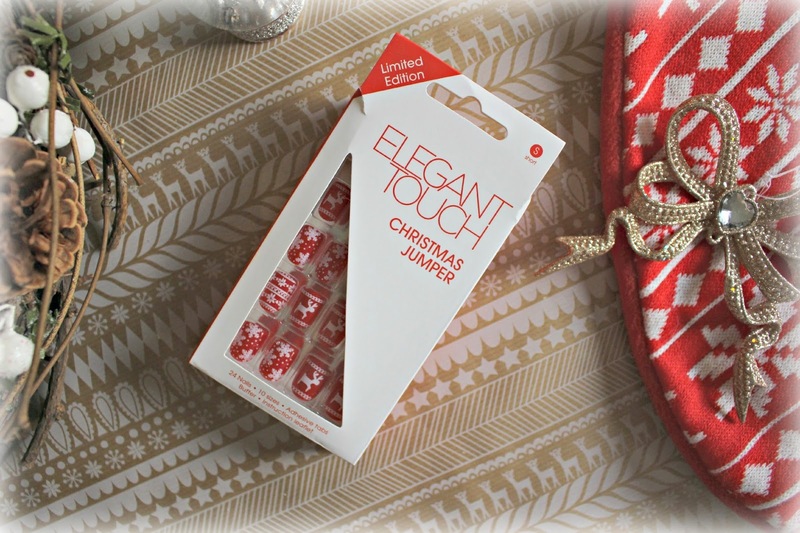 I saw the Elegant Touch Christmas Jumper Nails in Amelia Liana’s video and just HAD to get my hands on some – I’m not sure whether to give them away as a stocking filler or just wear them myself on Christmas day, but I adore them! False nails as a whole have been growing on my recently, since I had my nails applied properly by Sophy Robson at the BeautyMart event and now know how to make them last longer. These are the best festive nails I’ve seen so far – you can get them for £8 (and currently 3 for 2) on Very.co.uk here. Also in the top picture is Origins Ginger Burst Savoury Body Wash. It’s a festive fragrance which lathers the body in the comforting aroma of Ginger. I LOVE ginger, so this is pretty much a dream product for me, but it isn’t overpowering so you won’t go wrong buying a non-finer fanatic this body wash too. It’s luxurious and incredibly lathery (lathery?! you know what I mean!) and at £18 it’s not the kind of thing you would buy for yourself on a whim, which makes it such a lovely treat to open on Christmas day. You can buy it from John Lewis here. Promising 24 hours of crease free, vibrant shadow, the Urban Decay Eyeshadow Primer Potions are legendary tubes of amazingness, and you’ll find one in every beauty fanatics makeup drawer. This one has the added benefit of fighting the appearance of wrinkles, and improving skin tone and texture, yet it dries invisibly apart from a little bit of pigment which colour-corrects the skin. You really can’t go wrong buying a beauty lover this Eyeshadow Primer, it usually sells for £17 on John Lewis here. How cute is the presentation of this Only Fingers & Toes polish?! You just need to add some ribbon to this pretty presentation box to make the perfect stocking filler. I think this grey / mercury toned polish is ideal for the festive season, giving nails a hint of shimmer but remaining super chic. This high end polish is £16.00, you can get it from Harvey Nics, and again is one of those that you may not choose to splash out on for yourself, but is absolutely wonderful to receive in your stocking. My final stocking filler is the Clarins Blue Orchid Face Treatment oil. I feel like I’ve blogged about this a lot recently, in fact it features in another of my gift guides here, but I really think this is just such a lovely product to gift, and an even better one to receive! You can read a bit of a review in my Christmas Wishlist Inspo post here, but as a stocking filler, they don’t come much better than this! It’s £32.00 from Clarins here. What beauty products have you been stocking up on for your Stocking Fillers?